Heat the EVOO in a saucepan. Add shallots and sauté` until translucent. Add jam and vinegar and cook, stirring until jam has melted. Add more vinegar if needed t balance sweetness. Season generously with salt/pepper to taste. (It should not be sweet but more tart and fruity). This can be made ahead and refrigerated. Using a sharp knife make shallow slices into the skin and fat, creating a diamond pattern. Take care not to cut into meat. This will help the fat to render and the skin to crisp. Season generously on both sides. Preheat a large stainless-steel skillet(s) over medium high heat for 2 minutes, until hot. (Preheat the pans dry- the duck has plenty of fat already!) Add the duck breasts, skin side down. Turn the heat down to moderate-low and sear, without disturbing them, for 4-7 minutes; depending on the size of the breasts. (Smaller fillets will take 4 minutes). Turn the breasts over and sear an additional 2-5 minutes (again depending on size). The duck breast will be medium rare when you remove from heat. Remove breast to a plate and tent with foil or drape with a kitchen towel; to rest for 3 minutes. As they rest, the breasts will come up to medium doneness. Don’t over cook them! Slice thin on horizontal diagonal. 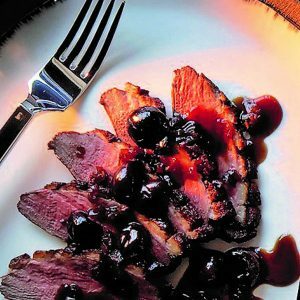 Serve with warm on plate first and topped with duck slices.